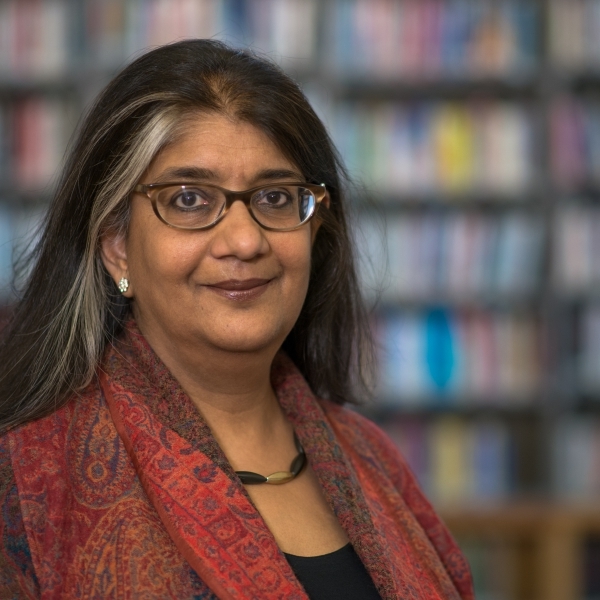 Shalini Randeria is the Rector of the Institute for Human Sciences in Vienna, Professor of Social Anthropology and Sociology at the Graduate Institute of International and Development Studies in Geneva, as well as the Director of the Albert Hirschman Centre on Democracy. Furthermore, she is a Visiting Professor at the Berlin Social Science Research Center and at the Free University of Berlin. She studied at the universities of Delhi and Heidelberg, was a Rhodes Scholar at Oxford University, and received her Ph.D. in Social Anthropology from the Free University, Berlin in 1992, and habilitation in 2002. She was Professor of Social Anthropology at the University of Zurich, as well as Professor and Founding Chair of the Department of Sociology and Social Anthropology of the Central European University Budapest, and has held Visiting Professorships at Ludwig Maximilians University, Munich, at the University of Vienna and at EHESS, Paris as well as at the Berlin Social Science Research Center and the Free University of Berlin. Professor Randiera has been a Member of the Senate of the German Research Council (DFG), President of the European Association of Social Anthropologists (EASA) and a Fellow of the Institute of Advanced Studies, Berlin. She has served on the Advisory Board of the Wenner-Gren Foundation, New York and as member of the Editorial Board of Annual Review of Anthropology. Caduff, Carlo, and Shalini Randeria. Forthcoming. Soziale Anthropologie: Zwischen Globalität und Lokalität. Hamburg: Junius Verlag. Randeria, Shalini, and Björn Wittrock, eds. Forthcoming. Contested Universals. Leiden: Brill. Bharadwaj, Aditya, and Shalini Randeria, eds. Forthcoming. Technologies of Life and of Mediated Existence. Special issue, Annual Review of Anthropology. Randeria, Shalini, ed. Border Crossings. Grenzverschiebungen und Grenzüberschreitungen in einer globalisierten Welt. Zürich: vdf Hochschulverlag, 2016. Das, Veena, and Shalini Randeria, eds. Politics of the Urban Poor: Aesthetics, Ethics, Volatility, Precarity. Special issue, Current Anthropology 56(S11), October 2015. Eriksen, Thomas Hylland, Christina Garsten, and Shalini Randeria, eds. Anthropology, Now and Next: Diversity, Connections, Confrontations, Reflexivity: Essays in Honour of Ulf Hannerz. London, New York: Berghahn Publishers, 2014. D’Amato, Gianni, Francesco Panese, Diedier Ruedin, Shalini Randeria, and Ola Söderström, eds. Critical Mobilities. London: Routledge, 2013. Conrad, Sebastian, Shalini Randeria, and Regina Römhild, eds. Jenseits des Eurozentrismus: Postkoloniale Perspektiven in den Geschichts- und Kulturwissenschaften. 2nd extended and revised ed. Frankfurt a. M.: Campus Verlag, 2013. Eckert, Andreas and Shalini Randeria, eds. Vom Imperialismus zum Empire: Nicht-westliche Perspektiven auf Globalisierung. Frankfurt a. M.: Suhrkamp, 2009. Fuchs, Martin, Antje Linkenbach, and Shalini Randeria, eds. Konfigurationen der Moderne: Diskurse zu Indien. Special issue, Soziale Welt 15, Baden-Baden: Nomos Verlag, 2004. Friedman, Jonathan, and Shalini Randeria, eds. Worlds on the Move: Globalisation, Migration and Cultural Security. Toda Institute book series on Global Peace and Policy Research 6, London: I.B. Tauris, 2004. Conrad, Sebastian, and Shalini Randeria, eds. Jenseits des Eurozentrismus: Postkoloniale Perspektiven in den Geschichts- und Kulturwissenschaften, Frankfurt a. M.: Campus Verlag, 2002. Elkana, Yehuda, Ivan Krastev, Elisio Macamo, and Shalini Randeria, eds. Unraveling Ties: From Social Cohesion to New Practices of Connectedness, Frankfurt a. M.: Campus Verlag, 2002. Günther, Klaus, and Shalini Randeria, eds. Recht, Kultur und Gesellschaft im Prozess der Globalisierung. Werner Reimers Konferenzen book series Suchprozesse für innovative Fragestellungen in der Wissenschaft 4, Bad Homburg: Reimers, 2001. Klingebiel, Ruth, and Shalini Randeria, eds. Globalisierung aus Frauensicht: Bilanzen und Visionen. Book series EINE Welt 6, 2nd ed. Bonn: Dietz, 2000.